Mandalas are one of the most powerful symbolism in all of Native American culture and tradition and are thus regarded with profound respect. They are used during prayer, ceremonial blessings, vision quests, and other traditional rituals throughout the various tribes. The creation of each mandala is a process that should be taken seriously, as they each symbolize the interwoven nature of creation. Native American mandalas are created by a group of people that have a deeper vision and an ability to think beyond themselves and this life. People who can truly appreciate and connect with the mandala know that our own desires and thoughts can often hide the deeper messages that are being given to us. We can use mandalas in order to unmask ourselves and uncover our true feelings and destinies. The diversity in the design of Native American mandalas is representative of the truly wondrous diversity within the Earth. The appropriate and most fitting one for our current life circumstances will be the one who speaks to our individual motivations most loudly. One of the most popular Native American symbols is the dream catcher. Although they were not used by every tribe, they were quite common in many, even if only in the last half century. The legend of the dream catcher comes from Sioux symbols tradition, in which a woman used a dream catcher to put her child to sleep. When the child was struggling to fall into slumber, the mother went to an old medicine woman, who recommended using a ring of willow branches with spider webs laced through the center. She explained that the ring would protect the child from bad dreams, allowing only the good ones to permeate the shield. Because of this story, dream catchers became popular items to hang above beds. The dream catchers evolved into having two distinct purposes: filtering and attention. The foremost task of this craft work is to filter our minds and protect them from negative infiltration during our sleep. Secondly, they allow us to recognize and appreciate the elaborate construction that makes up our lives while taking note that each of us has the ability to build and re-build different aspects as we see fit. Likewise, we also have the capability to achieve our dreams or turn our lives into nightmares. The feather construction is another of the most common mandalas. Feathers are important and highly utilized as symbols in all Native American cultures, as they symbolize a spiritual and mental ascension and strength. For example, chiefs adorned feathers in both their daily and ceremonial attire in order to show their sacred communication with the spirits. This communication is what made them wise, which pertains to the intellectual ascension. When laymen focus on the energies presented by feathers, they allow themselves to relax and feel the presence of the spirits. By absorbing this energy, anyone has the capacity to fully understand their own desires, beliefs, ideas, and purposes clearly. 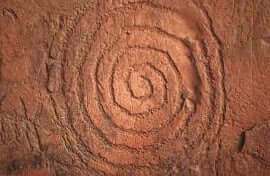 Another common Native American mandala is the labyrinth (or maze). The maze is easily understandable as a symbol of our journey through life, but it also speaks of an even deeper message. The labyrinth provokes us to ponder the heavy, philosophical questions in our lives. It also does this in its physical design, in addition to its spiritual symbolism. The Native American labyrinth does not have an ending; rather, it is infinite and reminds us that we are, too. Native Americans used this mandala to understand their beginnings in order to facilitate their journey. Life is what each of us makes of it, so we mustn’t be afraid to define it and set our souls free. Read about zigzag symbolism. The sun and wind mandala is the last of the most common across the majority of Native American tribes. Each and every group recognized the fierce power of the sun and the elements and how they affected their every day lives. This mandala represents the life-giving properties of the sun combined with the guiding spirit of the wind. Together these natural forces, which are often personified, gave the Native Americans an intimate idea of nature and its powers. They both respected and worshiped as well as feared these forces. Thus, the beliefs regarding these two forces were some of the most crucial building blocks of their cultures and traditions. We, too, can incorporate the use of Native American mandalas and use them as tools to guide our lives. They allow us to understand both our journey and its connection with nature and the universe. By relaxing and focusing on these Native American Mandala symbols, we allow our minds to block the chaotic nonsense and delve deeper into our souls. When we do this, we can form a spiritual connection ourselves and carry ourselves with a clear and joyful heart.